If you’re looking for the first climbing frame for you baby or toddler, then Cheeky Monkeys is the way to go. Designed specifically for the smaller members of your family, they’re perfectly proportioned for little legs and tiny hands. Cheeky Monkey climbing frames are available in a huge selection of sizes and configurations to help enhance your child’s playtime. Infant towers are the perfect way to introduce the youngest members of your family to active play whilst the wooden mountain frames are ideal for older children who are becoming more adventurous and are looking for more challenging play. Customise your Cheeky Monkey climbing frames with a huge selection of compatible accessories. From swings to periscopes, blackboards to flags and picnic tables to slides; it’s never been easier to transform your climbing frame in to a pirate shop or a castle, a mountain or a country house for your little one. 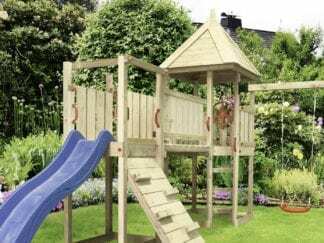 Manufactured from pressure-treated timber, Cheeky Monkey climbing frames have a ten-year anti-rot and anti-infestation guarantee protecting them from creepy crawlies and inclement weather. Cheeky Monkey climbing frames for babies and toddlers provide the ideal environment for your little ones to develop and grow a healthy appetite for exercise, adventure, and imagination. You can browse the full range below. If you’re struggling to decide which configuration works best for you and your family, please give our team a call on 01245 562 001. They are happy to offer impartial advice and assistance to help you make the right choice for your family and home.